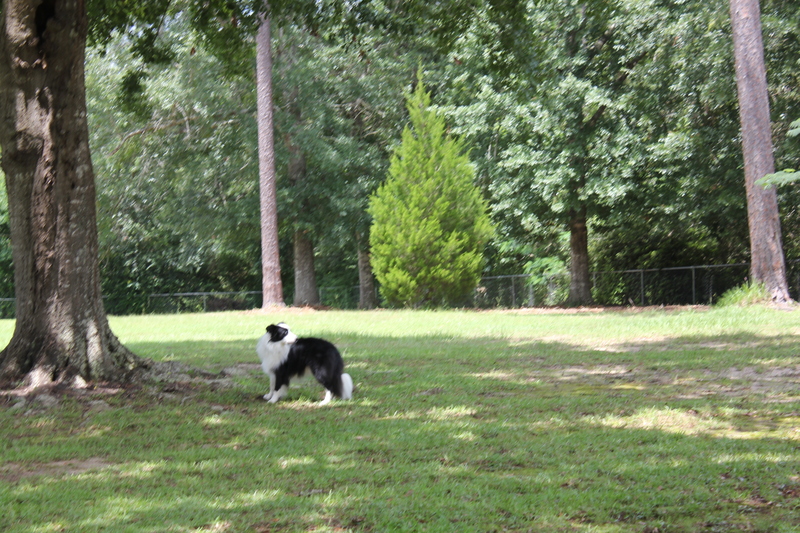 In a previous post I mentioned that my stubborn and independent Border Collie, Catcher, would not respond to my command to come to me when I wanted the dogs to leave the big back yard. It’s somewhat embarrassing when I tell people my hobby is training dogs, but there I stood with a dog giving me “The Paw”, the equivalent of “The Finger”, a vulgar sign we humans use to signal displeasure and disobedience. Why didn’t Catcher want to run to me with glee? What had I done to lose his trust? By the process of elimination the answer to why and how to fix our relationship finally became evident. A huge part of the answer lies with my senior dog, half-blind Levi. He is a dominant dog and I’ll admit with a hanging head, a frustrated Border Collie, with generations of herding in his direct lineage. He came from a working sheep farm in Washington State. My reading of him is that he gets frustrated, his pent-up energy pushing him to work and run even though he is ten years old. If he can’t herd sheep, which I don’t own or have access to, he has decided to herd the other dogs, using the same tools he would use on sheep: a direct, piercing stare, a nip, and pushing the dogs where he wants them to go. Catcher has unfortunately been on the receiving end of Levi’s nips. Levi also, as the self-designated fun policeman, doesn’t care for disobedience or rough housing inside the house. If I tell one dog to stop whirling, twirling, diving and/or leaping off the furniture, Levi will run over, quickly and efficiently, and nip the offender. I tell him sternly to stop and leave it. He respects my command. But you can’t ask a dog hard-wired to herd not to herd. So I manage his reactions with commands and an awareness that he may cover my back if he discerns that I have missed any infractions. In other words, I try to stay on top of Levi’s control issues. By choice, Levi always comes back inside the house first. Then he nips any dogs running in afterwards. I would always scold him while watching the other dogs and making sure the cat didn’t escape outside. It’s been very chaotic. Finally Catcher said, in body language, that he simply wasn’t coming inside and that’s where he and I were clashing. In hindsight, his behavior and the reason for it should have been obvious. It wasn’t clear to me at the time because I was assuming Catcher was being stubborn and I wasn’t looking at the environment that made him that way. Eventually the two young Border Collies mimicked Catcher’s behavior and they also hung back from the gate. I was frustrated and felt like I was a failure as a dog trainer and dog owner. One day I grabbed a handful of Fromm kibble and walked in the back yard with all four dogs. We played the name game. Levi? If he spun to me, which he always does, he got several treats. At ten years of age, this is not a new game for him and he was very responsive. Well, if one dog gets treats, it draws the others in to me within minutes. But no treat was dispensed until I said each dog’s name, then I rewarded the named dog for coming in quickly and giving me their attention. After a couple of weeks doing the name game in the back yard, the dogs quickly realized that no recall, no treat, meaning another responsive Border Collie earned extra treats. I made a big deal about dispensing goodies to the dog in front of me. Catcher is all about his treats. He even would check in with me before I called him. Now? Can I get my treat now? I also have a three-note whistle that I have always used for a recall and I have often used it instead of calling a dog’s name. Either sound earned a responsive dog tasty treats. The whistle brought in all the dogs or one or two and then I’d use the name game to reward them. Then one day I brought Levi in first from the back yard and closed an extra door within the house so he couldn’t in any way interfere with my positive training. The three remaining dogs had to learn to trust me that Levi the nipper was not around. I then rewarded their enthusiasm for coming to me. Four weeks into the program one bright day Catcher beat me to the gate along with his two little shadows. This is what I wanted all along: enthusiasm, trust and a desire to be with me, no chasing him down, no leashes or long lines, no repeated frustrated commands. If one of the Border Collies still succumbs to the call of the wild, chewing on fox droppings or sticks in the yard, they miss out on the food jackpot. I purposely name and treat the dog at hand, making a big deal of the reward. Every day the respect I wanted all along is returning. As I mentioned before, now I have to put the dogs on an intermittent reward schedule, maybe this time a treat or maybe none, and then to add value to the treat. Will it be a hundred-dollar treat, in the dog’s mind, or will it be a one cent treat? Liver or kibble? The dog never knows what a good recall will bring. As for Levi, no, he’s not poor Levi. He gets to run several loops in the safe back yard several times a day. He is nervous away from home, as evidenced when I had to board him recently. He cannot anticipate what will come at him in a strange environment due to his fading eyesight. I received a notice about a herding instinct test to be held locally in March. But I don’t think it is fair to enter Levi and ask him to respond to something he possibly cannot see. He’d probably work his heart out trying to herd the sheep but may become stressed or hurt, especially with so many strange dogs in close proximity. My goal is to keep him safe and for him to trust me. 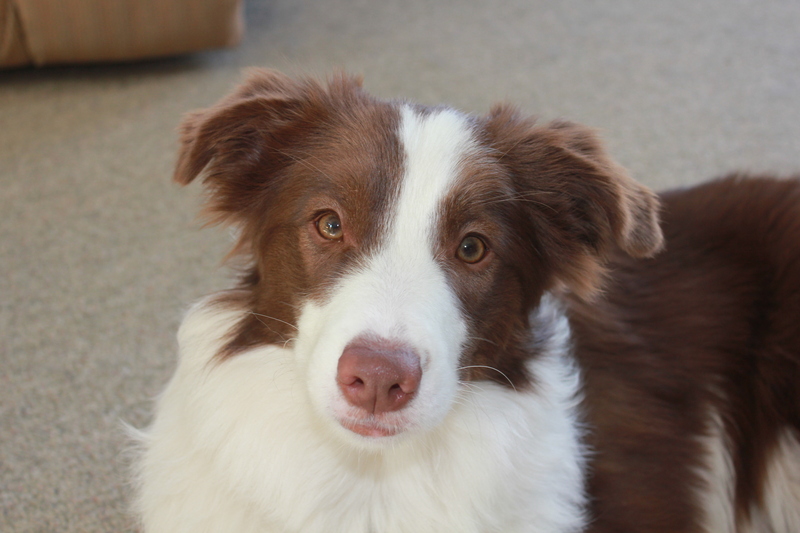 Just because he’s a Border Collie doesn’t mean he has to have a herding title. I’d rather he herd me raking leaves or cleaning the yard. My pack is becoming a cohesive unit but owning and managing four dogs and a cat is not a static job. They keep me on my toes. They depend on me to keep them safe, healthy and well exercised and in return they keep me mentally alert for changes, signals and problems. Sometimes I don’t always figure out the solutions to the problems in a timely manner but hey, cut me a break. I’m only one human living with four canine Einstein’s. And…to add to the mix I discovered this morning that nine month old, Razz, is in heat. Let the fun begin. 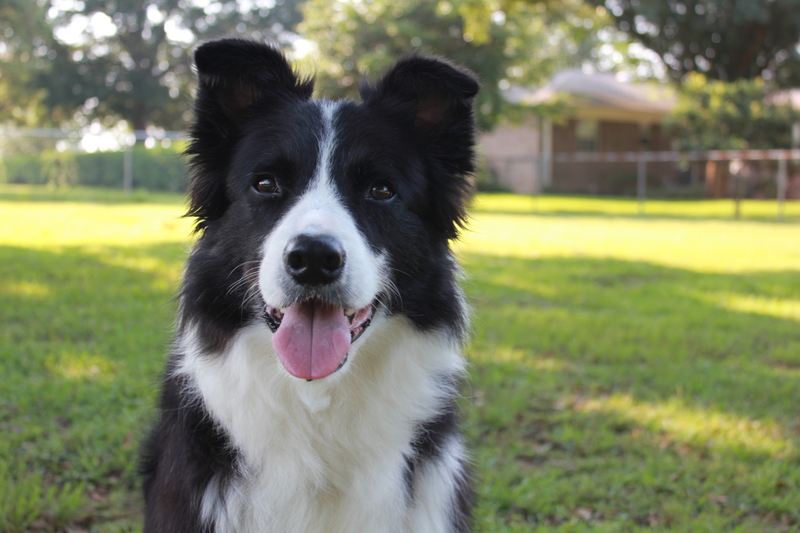 This entry was posted in border collies, dog obedience, Dog training, Dogs, Retirement Life and tagged Border Collies, dog obedience, Dog training, herding, Obedience training, retired life. Bookmark the permalink. I much enjoyed your descriptions of the trials of living with your pack. No question that the pack is a complex organism, and all the more interesting if it’s a BC pack!